Friday Movie in the Park: "Star Wars Episode VIII: The Last Jedi" | McCoppin Sq. Friday Movie in the Park: “Star Wars Episode VIII: The Last Jedi” | McCoppin Sq. 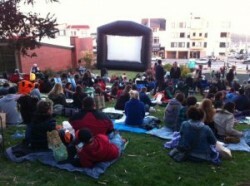 Movies in McCoppin: Friday Outdoor Film Night | Sunset Dist. Enjoy free movies at McCoppin Square in the Sunset District happening on the first four Fridays in October 2018. Movies begin at sunset, approximately 7:15 pm, but come early as the fun starts at 6 pm. Grab your family and friends, and don’t forget to bring some popcorn and blankets.